Let’s start the week right with a contest! Up for grabs is a free pass (for two!) to Carlos Celdran’s Living La Vida Imelda tour of the CCP Complex. 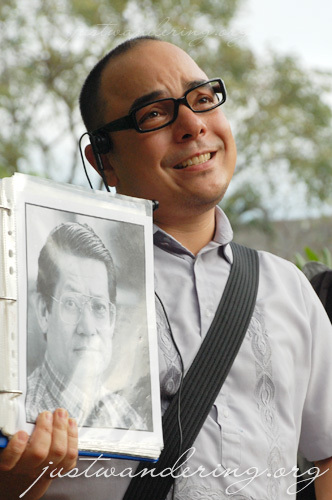 Why don’t I have a photo of Carlos with the Imelda photo? Fail. I’ve done the Imelda tour last March and the Intramuros tour last April. I thought more people should experience one of Carlos’ tours, and here’s your chance to try it out for FREE! All you need to do to get this free pass for you and a friend is to answer a simple questions: If you have a guest from overseas, where in Metro Manila would you take him/her? Give specific details — sights you’ll see, food you’ll try, transportation you’re taking. The more unique the itinerary is, the better your chances for winning! Simple no? Post your answers on the comment section. Only one entry per person, so make sure it’s perfect! Contest starts now and ends at 11:59pm of July 8, 2010. One comment is equivalent to one entry. Duplicate comments will only count as one. Contestants must enter with a valid e-mail address. Contest runs from July 4 to July 8, 2010. The winner will be chosen based on the quality of the comment. Winner of the contest will be announced in the website and notified through e-mail. DEFINITELY not in the malls! I would take him / her through a tour of my culinary childhood, where my family and I used to eat regularly. Then give him / her a calesa tour inside Binondo, stopping by some of the culinary bests like the original Savory branch and Ling Nam Noodle House. Then buy some pasalubong at Salazar Bakery. I will take my guests straight from the airport to Chinatown, as I’ve noticed our version of Chinatown is more “authentic” than those found in the west. I will negotiate for a karitela ride (s) from the end of Binondo to the other side fronting Sta. Cruz, skipping Divisoria area where traffic is terrible, whatever month it is; I will probably make them come back for another trip to Divisoria for some real bargains, if shopping is on their “to-do” list. I will make them visit and take pictures of both the Sta Cruz church and the Binondo church, which are comparatively at par with other countries’. For food (whether lunch or dinner), I will go for those quaint hole-in-the -wall types as they are more reasonably-priced and serves authentic chinese food (depending on the region in China they are representing); like Ma Mon Lok and Wah Ying in Benavides, Ang Tunay Beef and Mc Gee in Gandara, or if they prefer healthy vegetarian cuisine, Happy Veggie along Masangkay is a good choice. For dessert, ube yam cake (although they have other varieties as well) and other sweets from DEC is a must, even for take-outs and pica-pica. If they would like to try out some oriental healing/ medicinal supplements, Chinatown is also a good place to look; not to forget jewelries and pure chinese-standard gold pieces. A walk along what used to be, Roxas Boulevard for a night-cap is also recommended, if only to “help” digest the food that were taken on that first day, aside from experiencing the famous Manila Bay sunset. A visit to historic Intramuros and the “Walled City” and what used to be Smokey Mountains can be included for another day; and we can cap that tour with a visit to the Museo Pambata, CCP and the nearby establishments, including the grounds near Mall of Asia (MOA) if only to “brag” a little about the size of the Mall where one can find everything, from medical to food to entertainment. Many overseas guests look at Metro Manila as what guidebooks see it, so it pays to get out of the ordinary and see the place in a whole new perspective. First off, I can bring my guest to a neighborhood Tapsilog joint for a truly Pinoy breakfast. We can then head on to a tour of Central Manila, such as one of Carlos Celdran’s tours, as a guided tour of Manila will be best for guests from overseas. We can then explore Intramuros, ride a calesa, and have lunch at the Aristocrat, which is really one of the monuments in Roxas Blvd. I’ll also make sure that we ride the jeep when moving from one place to another, letting my friend pay the fare with “bayad po” and saying “para” to alight. We will spend the afternoon in Divisoria for shopping, especially Tabora St. where native crafts abound. We can have a quick stop to see The Metropolitan Theater before heading on to the Mall of Asia for dinner. It will certainly be a full, tiring day but it still can’t be complete. In fact, a trip to Manila is never complete as it always brings something new and diffetent to everyone everyday. 4. Take a cab and go around the CCP complex. 6. Go to Intramuros – visit San Agustin Church and Museum. Better if you had a car with a driver, But in certain instances a taxi would suffice. 1. Will start early and head to Guadalupe for a Ferry ride to Intramuros, It will give my visitor a glimpse of history of the Pasig River and see landmarks on a different vantage point. 2. A tour of Intramuros, ride the Kalesa then to Fort Santiago for more history about Fort Santiago, San Agustin Church, the museum inside. 3. Then off to Binondo for some culinary and street food adventure. First is the Balut which every foreigner dreads and then some good Chinese food. 4. A Divisoria wet market experience, as in we will but some meat and fish for lunch. 5. A cab ride to DAMPA at Macapagal for lunch. 6. Then a good beer at the Manila Bay for a great sunset to end the day. We started with the “Do-it-yourself”-tour, which is recommended on his homepage. So we had a look at thrift-shops in Evangelista Street, Bangkal, Makati (went there by taxi). Afterwards we had a taxi-ride to TiendeSitas which was awesome for her because she could do a lot of Souvenir-shopping. From there we took a taxi to Cubao-X which I absolutely loved. Unfortunately we were a bit too early so that some shops weren’t open yet. I recommend to go there after 4pm. In the evening we had dinner and a few beers at TJ-Grill in Kamagong-Street and walked to Saguijo afterwards. There we listened to some fantastic band. Sunday: After breakfast we took a taxi to Buendia bus station where we changed for a bus to Las Pinas. In Las Pinas we had a look at the famous bamboo organ in the St. Joseph church (went there by Jeepney from the bus station). Someone played for us which was really nice. Afterwards we took a Jeepney to the Jeepney factory. It was nice to watch how these unique vehicles are built. From there we took a Jeepney to the next taxi station where we asked the taxi-driver to bring us to the river ferry station in Intramuros. We boarded the ferry and had a very nice ride on the Pasig back to Makati/Guadelupe. I would definitely take them to Corregidor and Carlos Celdran’s Intramuros tour so that they can experience what Manila was like before. We will then have a sumptuous dinner at Dampa or Kamayan Restaurant. I will also take them to Divisoria for some bargain shopping and to Greenbelt 5 for them to see that we have the best of both worlds here in Manila. A day tour to Luneta Park and National Museum would also be nice for them to experience. Ah, Simple, And i did this before, not an exact foreigner, but a cousin who went here for the first time. QUIAPO! ah, the land that i love. I dont think that this will be the “most unique” because surely everyone has done this before. we live in Quezon City going to Quiapo, we’ll take a jeepney from commonwealth avenue to Quiapo. jeepney because what could be more filipino than jeepneys with horns blaring, toothless barkers, stickers of “barya lang sa Umaga” and the quintessential “ma., bayad po” making each passenger pass your fare and announcing to everyone how many are you, where you are going and where you came from. of course i’ll make the guest do the talking. once we get there, ill take the guest to Quiapo Church, i may not know the full histrory of Quiapo church, but i do know the basics: its history, when it was built, what got it destroyed and the architect of its restoration, just to have a historical perspective. the church itself is already a siight and site to see. I’ll show how many people would come to see the balck Nazarene, and in case its open, we’ll fall in line to touch the Nazarene. Light different colored candles, (my favorite is for the one for the appliances.) Ill also show the guest the ladies you “:make donations” to to pray for you, all the astrologers and fortune tellers, we’ll try it too. Also we will visit the herb vendors, the anting-anting vendors we will even buy Sto. Niño de Titi. We ill try to visit the SM in Quiapo, just to show the progress SM had. In Hidalgo, Ill show the diffrent stores. then we will proceed to Quiapo Ilalim, and show the different native products,. in case we get hungry there is always the most delicious Hopia in Manila. then to Manila’s Videotheque. where the world cinema is at your finger tips. i do this alot, just going around quiapo looking at old houses destroyed by time and mostly neglect, and imagine it during the hey days. I love quiapo because there is where i meet different people, all sorts of people. and evferyone is just interesting from the sampaguita to sidewalk vendors, the muslim businessmen, the religious, (who buys anting-anting and consult fortune tellers) even to the mendicant who litter the streets of quiapo. but what i do love most about Quiapo, is that it is easy access to just about everywhere in Metro Manila. so after quiapo we could go and walk in Avenida and Rizal Avenue, visit Intramuros, watch a play in CCP, watch a movie in SM manila, see the sun set in Roxas Boulevard. In Quiapo, the adventure is just beginning. We will start at 10am sharp when the brightness of the sun is so perfect for picture taking. then we will ride on a jeep for our next stop which is Intramuros. In here,we will also visit the historical Manila Cathedral church, take a kalesa ride and have some photos taken especially at the Balluarte.After that,i will take them to Luneta Park. Approximately,after having our photos taken at the Rizal Park, the time is 12pm. I will look for a turo-turo or a Karinderia for us to take our lutong pinoy lunch. After eating,we will visit Manila Ocean Park and stay there up until 2.30 or 3pm. Of course, animal tour wouldn’t be complete without a tour at the oldest zoo in asia.,- the Manila zoo. at 4 or 4.30 pm,i’m gonna look around for some turon or palamig to offer them.. then, we will proceed at the baywalk. Probably, that would be our last stop.We’ll have pictures ’till the sun goes down. Q: If you have a guest from overseas, where in Metro Manila would you take him/her? A: We will go to 168 Mall at Divisoria. It’s one of a kind experience for them just be careful with *you-know* snatchers and all. Tour them to China Town then to the famous places here in Manila like Intramuros, Post Office, Raja Sulayman Park, Manila Cathedral, and Manila Zoo. Lastly, I’ll definitely drop him/her to MOA. It’s now a tourist destination and a must for overseas to go there. Then, go to the church nearby and I’ll let them experience the sunset at Manila Bay since there’s a mini-cruise there. If I were to take a foreign friend someplace in Metro Manila, I would definitely start from Quiapo pass through various landmarks and end the tour in MOA. My reason is simple. I will try to show my friend the gradual history of our country. We will start with Quiapo to show where is the ordinary Filipino masa today. Then we go from pre-colonial times so I will show Ongpin or Chinatown. Afterwards, a tour to Intramuros to show the Spanish Colonial Era and then a tour to Taft Avenue and Rizal Park for the American Colonization. Next would be a tour to CCP for the post colonial era and the Marcos Regime. Lastly, I will show my friend MOA so that my friend can see where the Filipinos are today and at the same time my friend can compare the other side of the modern Filipinos from the ones in Quiapo. My trip would start like this. First, I will bring my guest to Quiapo Church because I believe that the Quiapo Church and the nearby Plaza Miranda is significant to us Filipinos. I will give a brief history of our culture and the relationship of the Filipinos with religion. After that we will go outside the Church and I will point out the big oxymoron in Quiapo. Doesn’t anybody find it a big oxymoron that inside the Church, everybody professes to be a Catholic but literally a stone’s throw away from the wall of the Church, there are lots of fortune tellers? So if ever, I would give my friend the choice if he or she would like to experience having a fortune telling session. This is just for the experience and just for my friend to have a clearer picture of the irony of Filipino culture. After that, I will bring my friend to Plaza Miranda and explain the significance of that small plaza: that a lot of revolutions and prayer rallies during the Marcos and pre-Marcos regime happened there. After that, I would try to feed my friend Balot or Isaw which is readily available there. If she or he refuses since Balot and Isaw is taboo in some cultures and it’s a Filipino delicacy then I’ll just suggest the Penoy, Taho or fishball. After that I would suggest shopping for about 2 hours for my friend to find bargain goods. After shopping, I would then hail a pedicab so my friend could experience a different kind of transportation which is not easily seen abroad. I would then bring us to Chinatown where I would then explain the important relationship of our country with our Asian neighbors during the pre-colonial era. I would point out the culture, arts, trade and economic ties we had with them. During our trip to Chinatown, we will use the calesa since this form of transport is still used in Chinatown and Ongpin. Afterwards, still using the calesa, I would ask us to be dropped in Intramuros where I will explain the 333 year colonial era of the Spaniards in our country and how it affects the Filipinos even now. I will then explain the importance of the walled city and the reason for its location. And I will end my explanation with the Mock Battle in Intramuros and the start of American colonization in our country. By this time it will already be lunch time so for lunch, I will treat my friend in Intramuros where an authentic Spanish dish will be our meal. After lunch, we would get a taxi going to Rizal Park. However, I will request that the driver to drive by the Manila Central Post Office then pass by the Manila City Hall and the National Museum and then he will drop us off to Rizal Park. My reason is simple. This is to continue explanation of the Philippine history and culture to my friend. Since I stopped with the start of American Colonization in Intramuros, I will then explain to my friend the significance of Rizal Park or Bagumbayan. Also, I would explain the significance of Manila Central Post Office, Manila City Hall, the National Museum and the various offices near Rizal Park. This is all part of the plan of the Americans to pattern Taft Avenue like that of Washington wherein government offices are centralized. However, with the war interrupting American Occupation all these plans did not come into fruition. After we have walked around Rizal Park, I would then bring my friend to CCP. But this time, we will use the Jeepney. When we arrive at CCP, I would point out the ferry going to Corregidor and the significance of this tiny island as well as Bataan in World War 2. Then my friend and I would roam around CCP and I would then explain post war Philippines until the Marcos era to my friend. I will show the good parts as well as the not so good parts of the Marcos regime. Question: if you have a guest from overseas, where in Metro Manila would you take him/her? Answer..: Will hear mass first at Baclaran church then will take them to Carlos Celdran tour the Intramuros tour ( visiting Fort Santiago, the Manila Cathedral and San Agustin Church, riding a Calesa etc.) coz I have joined that tour last May and that was really a fun learning experience, sir Carlos is the man..he is awesome and is so kind..I’m sure they will appreciate Manila more once they experience the tour. I will also include taking them to attend Imelda tour coz I i know my tita and cousins are such an imeldific person too, im sure they will like it too.. will also reserve slot for ivan mandy’s old manila walk on the next day to taste what food has Binondo or the little China has to offer. I will also take them to the Manila Ocean Park then Mall of Asia afterwards. Then for pasalubongs will also visit Divisoria and 168mall but will not forget to visit Quiapo before day ends.. I will bring them to the squatters area of tondo. I will show them the real manila and not sugarcoat any of our flaws.Just like the movie slumdog millionare. I would love to show him/her what Broadway theater is like in Manila:). I think our musicals are still the best. If you have a guest from overseas, where in Metro Manila would you take him/her? i will take my guest in an ilog pasig ferry ride, can definitely see the whole metro. and maybe we’ll take a peek in smokey mountain, that way i can let my guest see the real face of manila. maybe in that way my guest will no longer go abroad and will just stay here and help filipinos and make the philippines a better place. I’m not good in planning itineraries. You see, there are so many places to be visited with so little time. But anyways, here is what’s on my cluttered mind. We should have pandesal and kape for breakfast. As soon as we leave the house, we will shout “TAHO!” and “PUTO!” outside. We’ll take the jeep, tricycle, bus, train and MRT in all the places we’ll be going. Then we’ll go to Manila Cathedral, to show the religious side of us and its history having been built since the 6th century. Oh, she must make a wish because like what my parents tell me, if it is your first time to go to a church, pray and it will be granted. Last is at Roxas Boulevard Bay Walk to see a fine view of the legendary Manila Bay sunset What a great scene to end the day. A foreigner seeks for the culture, food, history and hospitality of the Filipino people. As a teaser, we will ride the cab or taxi down to Intramuros. I’ll treat him to the lokal “turo-turo” offering one day old, the famous “kwek-kwek,” and some dumpling experience for a small break. The walled city hp the best destination for them to introduce the richness of our values. It explains the artistry, talent, bravery, social apt, and among others. We will ride the “kalesa” or the more humane way instead of pallanquin. Like Magellan, we will circumnavigate the vicinity and let him enjoy the area while giving insights of the spots. Next is the shrine of Dr. Jose Rizal or the Luneta Park. I’ll bring my old paper money and several coins which portrays our National Hero. And I’ll tell him some of his contributions for our independence. He is my idol and role model, for the love of our country after God. A small meal from the local “Mang Inasal,” the most famous marinated chicken. I’ll also explain how to eat it using hands and dipping it to “toyo-mansi”. The next pit stop is the EDSA Shrine. We will ride the MRT from Taft to Ortigas. Displaying the unity of the people for the past decades. The shrine itself, the Ortigas Ilalim route of bus and the People Power Monument for the few to be proud of. A small snack from the “Mamang Sorbetero” will be special. A bun filled with ice cream is very excellent after walking a half kilometer long journey. Then, we will use the mass transport system of bus from Ortigas to Cubao. A stroll from AliMALL will shaken up the hot senses from the sun. After that, we will ride the jeepney routing Cubao and Montalban. “Patok” jeepney is the name of those who have loud music, colorful interiors, overspeeding and very fast jeepney. I’ll explain to him that it serve us by transporting merchant and goods from provinces to rural or urban areas and now, even passengers. We will alight at the Shoe Capital of the Philippines, Marikina. For me, it is our symbol of cleanliness and development. The Marikina River is a great facade for a small talk. And I’ll bring him to our house to accommodate and take care of him. Rest assured, he’ll enjoy the hospitality of us. Honestly and seriously, I will drag my guest outside Manila. I want him to have an unusual and unforgettable experience here (outside Manila but still near the city) that he can show off to his friends. The best and only place I have in mind is Mt.Pinatubo Crater Lake. Ang surreal! Ewan ko nalang kung hindi sya maubusan ng adjectives pag nakita nya yung place. Of course, for the main purpose that I want my friend to learn the Philippine history, I would tour my friend to Intramuros. But after an informative afternoon at that historical site would be the highlight of our trip, I would definitely take my friend to Luneta, reeking of history, Pinoy culture and the true face of reality what with the nearby squatter area. Luneta, overlooking Manila Bay, I believe is one of the places that strongly symbolizes Filipinos, having witnessed our national hero’s death. We would ride the kalesa and feast on street foods like isaw, toknene, kamote cue and sago’t gulaman. And we will take a walk at Roxas Boulevard while enjoying the Manila Bay sight amd snacking on a balut. Truly, whenever I hear Side A’s Manila Song, I would always think of Luneta (and I firmly believe they have Luneta in mind while writing it). And just like the song, we would always come back to Manila, to our dear country, just as most Pinoys will (yes, I think this is true too) if they have the chance. Because country roots, wherever in the world we’ve been at, digs deep. For teasers, I’ll give my overseas visitors a historical tour of Manila covering Imelda Marcos’ shoe fetish showcase at Malacanang; tour the Spanish walled city, Intramuros; Jose Rizal’s relics at Fort Santiago and Luneta, where he was executed; more of interesting facts on Filipino ancestry at the National Museum and Escolta/Binondo area, where my guest would want to take the “calesa” ride. After the historical feats, I’ll take them to the south to enjoy nature and fresh fruits at its finest. Our first stop would be Tagaytay Picnic Groove. I want them to see the famous Taal Volcano/lake. We will tour Palace in the Sky, Paradizoo and Rodeo Inn/Zoo. The next day, we’ll take the route to Nasugbu, Batangas where a lot of beach abound. I would love to bring them to Punta Fuego for a round golf and then a banca tour. On weekends, I’ll take them to Puerto Galera in Mindoro for snorkeling and scuba diving fun. This contest is very timely as I have a Chinese-Malaysian friend visiting Manila sometime in September. 1) Binondo – for a food trip. I intend to show him our own Chinatown and we can then discuss the similarities and differences of the Chinatown in KL and here in Manila. I will make him eat the Eng Bee Tin tikoy (all variants) and hopia. When I visited his place in My, he took me hawker food-tripping, so it will be my turn to give him a treat. 2) UP Diliman campus grounds. I will take him strolling and jogging around the UP Oval, watch some students play soccer in the Sunken Garden while eating taho, and then take him to Rodic’s to sample the Tapsilog. 3) Legaspi and Salcedo weekend markets to shop around for…more food! 5) Rizal Park – to pay homage to our National Hero. I’m a very frugal (aka kuripot) person so I’ll bring my friend to places that are easy on the budget yet captivating. First, we’ll ride a jeepney and go to Ninoy Aquino Parks and Wildlife Center (for only 10php). Its a nice place to see Philippine Biodiversity. For brunch, we’ll have a picnic near the man-made lake and enjoy the relaxing view of nature. Next, we’ll head to La Mesa Eco Park and spend the whole afternoon doing different activities like riding a paddle boat, fishing, swimming, trekking and biking. Not only that we’ll enjoy, we’ll also help save La Mesa Watershed. After that, we’ll go to Marikina wet market which has generally cheaper prices and at the same time, clean establishments. We’ll buy food like kakanin, fresh fruits and seafood. We’ll also check the biggest shoes at the nearby mall. This is a good opportunity for my friend to practice his haggling techniques. During the evening, we’ll have a walk at Marikina River Park which is open 24 hours. There we’ll find restaurants, bars and grills; even simple eateries and carinderias. I really hope we go there Christmas season beacause it will become livelier with the entire stretch of the river transformed into a bargain tiangge full of vendors, carnival rides, shows and lantern parades. Congrats to the Living la vida Imelda contest winner!